A proposed roof deck bar at the site of the old Coast Inn and Boom Boom Room sparked debate at the Planning Commission meeting last week on guidelines for historic renovation in the commercial zone and along scenic Coast Highway. Beyond objections raised by Coast Inn neighbors about the size and scope of the project, Laguna architect Morris Skenderian expressed general concern related to the aesthetics of umbrellas, heaters, lighting and crowds on rooftops, and requested consideration of a policy to better deal with forthcoming applications. “It is affecting the character of our city, and affects skyline and ocean views, and it is effectively adding another level to the building over the height limit,” Skenderian said. Mozambique’s open air deck, known as the Veranda. The first rooftop bar at historic La Casa del Camino Hotel opened in 2007 and quickly became a popular destination, followed in 2014 by a third level addition to Mozambique, and Skyloft in 2015 at the historic downtown Heisler Building. 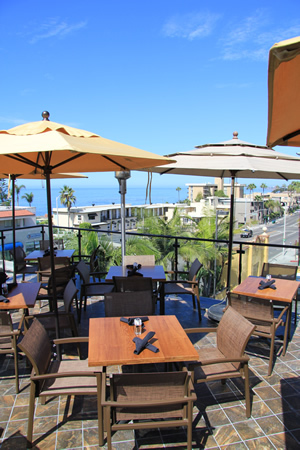 By comparison, Huntington Beach has 10 rooftop bars and Newport Beach five, but none in nearby Corona del Mar, Dana Point or San Clemente. Two applications related to rooftop bars came before the Commission: a request for expanded hours and additional equipment at Skyloft, and a first look at plans for the Coast Inn by Dornin Investment Group. That proposal includes a boutique hotel, three restaurants and a roof deck bar, as well as a spa and conference room below and behind a market in place of the Chris Abel designed Coast Liquor. The city’s Historic Preservation Ordinance, revised in September, makes no mention of rooftops beyond height limitations and maintaining the integrity of the facade, and the state regulatory authority is limited to state-owned buildings or those eligible for federal tax credits, according to Julianne Polanco, the California State Historic Preservation Officer. “When we review rooftop decks or pools, we use the national Secretary of Interior standards on how that project affects the historic resource,” Polanco said. “We look at the visibility in comparison to the surroundings and also whether it is a permanent or temporary element,” Polanco said. Parking, the number one challenge facing the city according to resident surveys, is also a major concern for neighbors of hotels and restaurants and historic properties benefit from vastly reduced parking requirements. The Planning Commission initially incorporated parking reduction guidelines into the general plan to address historic elements, according to former Commissioner Norm Grossman. “We never considered that what makes sense for a small structure may not be applicable to a much larger building,” Grossman said. Even with a Coast Inn capacity of guests, diners and drinkers of 457, plus potential special event attendees, the property pencils out to just 17 parking spaces by virtue of an E-rating, the highest historic rating recommended by the Heritage Committee, which grants up to 75 percent reduction in parking spots. However, that committee is advisory and it is the Planning Commission’s responsibility to issue historic ratings. Commissioners concurred with the community development staff’s long list of next steps, starting with a parking study, and traffic and noise analyses, as well as elimination of additions to the market building to preserve the ground-to-sky open space and a thorough review of the major elements of the project, including the roof deck. Plans will be reviewed again on Feb. 15, 2017. The Commission denied extended hours of operation at Skyloft, but agreed to permit up to six musicians, instead of the four limited by the current conditional use permit. However, they refused additional umbrellas and heaters on the rooftop, despite owner Sam Goldstein’s contention that too many patrons cook in the afternoon sun and more heaters are needed to quell the nighttime chill. Skyloft will come to the Commission again in six months, despite the police chief’s report that the operation is in compliance with operating guidelines and the noise level does not exceed the sound of traffic or the nearby busy White House restaurant and bar. No date was set for discussion of a rooftop policy or reconsideration of parking benefits for historic structures. In other business, a gourmet popcorn shop at 490 South Coast Highway was approved unanimously. Ground level proposals have a definite edge right now.